This is the second part of my photos from my trip to the beach. I did not have time to process them all yesterday so here they are in an extra bonus post. On the fence right near my camp. 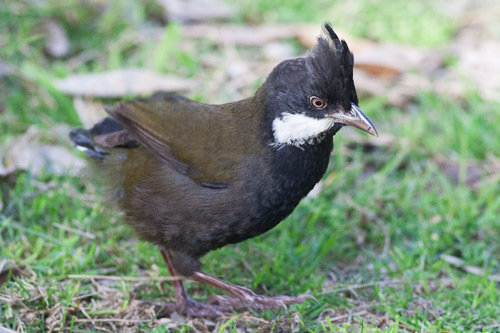 This Eastern Whipbird, with three of his mates hung around my camp for a couple of days. This is front on showing the chest. 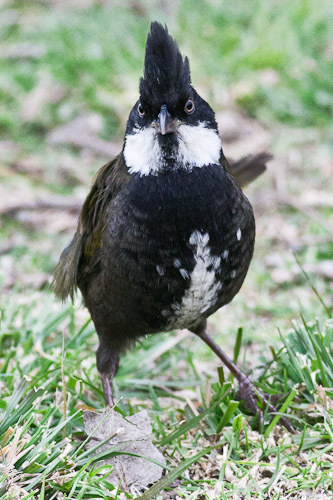 He looks a bit angry bird. This one has got no tail. I have no idea why or how. I Headed down the mountain to the beach for some rest from the cold of the snow. There was not much sun but it was nice for a change. 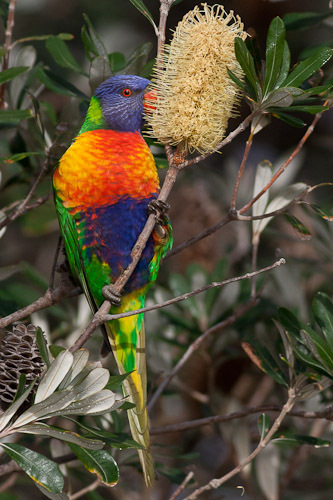 Tathra is about twenty kilometers from Bega, on the south coast of New South Wales. Kianinny Bay is a very protected anchorage and boat ramp in Tathra. 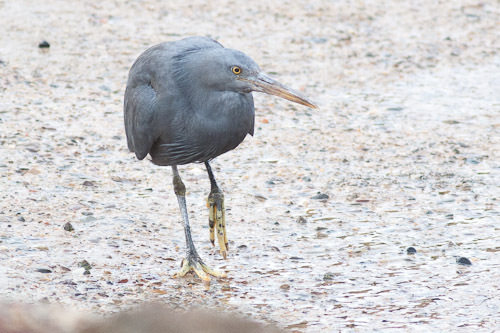 The water was crystal clear and there were a bunch of Silver Gulls and an Eastern Reef Egret, Grey Morph, hanging around where the fishermen were cleaning their catches. Gillards Beach, Mimosa Rocks National Park. Further north is Gillards Beach in Mimosa Rocks National Park. It is an isolated beach with some excellent camping sites right on the beach. I spent two nights here and had a very restful time. 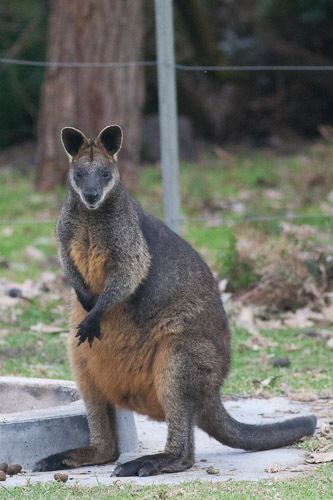 There were lots of macropods around, mainly small Swamp Wallabies and a few Eastern Grey Kangaroo. 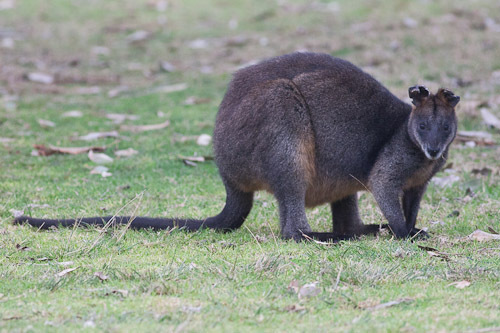 The Swamp Wallaby (Wallabia bicolor) is also called the Black Wallaby or Black-tailed Wallaby. 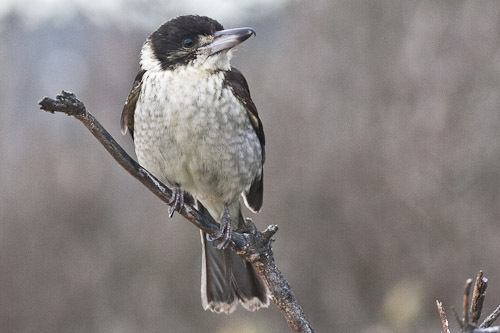 They have a distribution along most of the east coast of Australia. 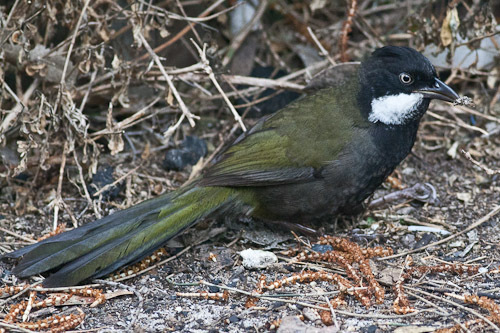 The Eastern Whipbird (Psophodes olivaceus) has an olive-green back, a black crest, long, broad tail with bold white cheeks to sides of neck. 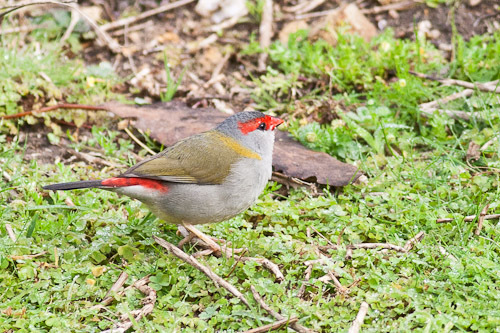 Normally they are very shy and are very hard to spot. But there were four of them around my camp and they would move around scattering leaves and not showing the least interest in me, except to bite me on the toe at one stage. One of them had a truncated tail, and I could not work out the reason for this. Sawpit Creek is 1200 meters above sea level in Montane forested area. It is at a boundary between wet and dry sclerophyll forests. This is an area where snow falls but does not last. 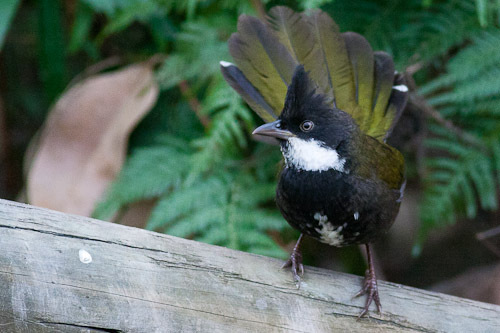 The White-eared Honeyeater has a conspicuous white ear patch with a black face, chin and throat. 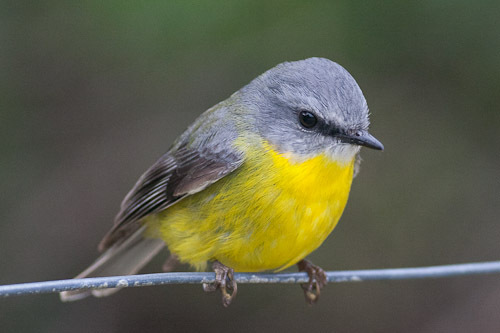 They have bright olive-green upperparts and a yellowish-green abdomen (Simpson and Day). 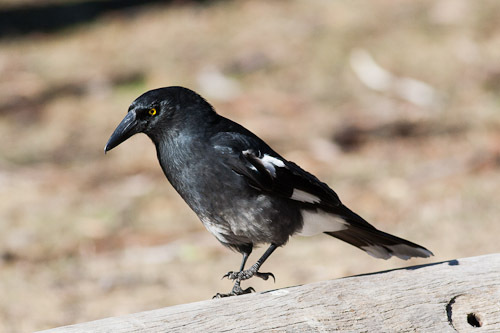 The Pied Currawong has a hooked bill and yellow eyes. 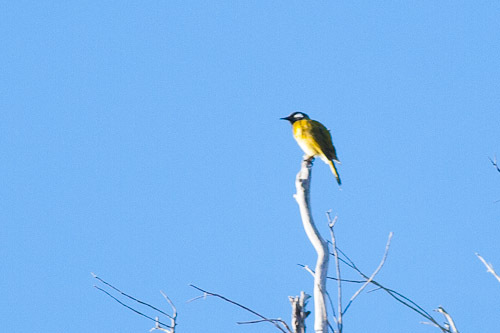 There is a prominent white patch on the wings. In the picnic areas around the national park, they have taken to stealing food from travellers. They stole a cheese sandwich from me. As soon as you turn your back on them, they are at your table, looking for anything to eat. 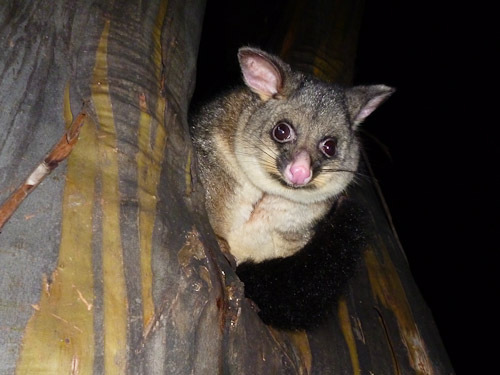 Last night, at Thredbo Diggings camp, I managed a shot of a Brushtail Possum in the tree. They too, like to steal food from the campers at the picnic areas. Waste Point is just before the gates to the National Park going up the road to Perisher Valley. You turn off a couple of kilometers after the Thredbo River crossing. This morning was the coldest morning all winter I reckon. Someone later said it got to minus eight Celsius last night. There was frost everywhere. 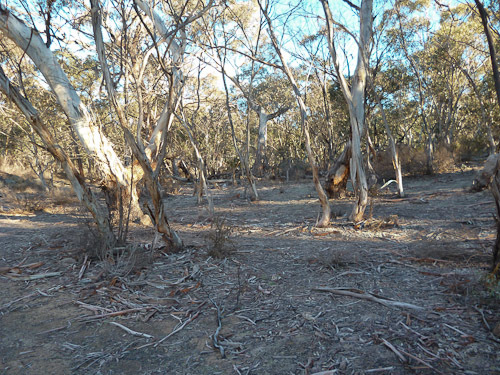 There have been a few big bush-fires lately so the bush is pretty burnt out and there is not a lot of undergrowth and there are a lot of dead trees. 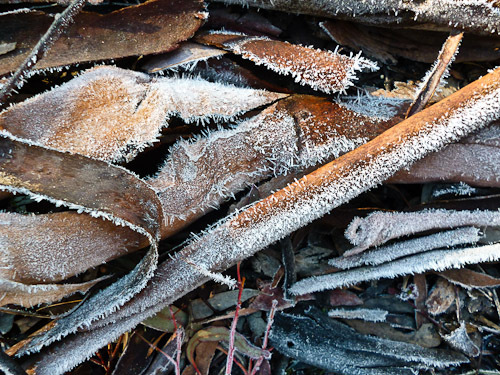 There was frost everywhere on the ground and gave me lots of chances to find some interesting textures. Frozen icicles were coming up out of the sand at the edge of the lake. 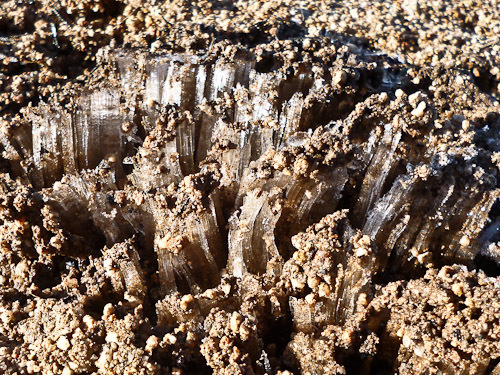 It must have been all the moisture in the sand freezing into columns of crystal ice. It looked really weird. 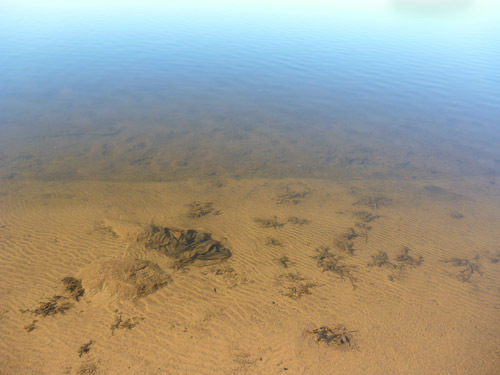 And some water in the lake which seemed to extend into a gaussian infinity. A panorama of the Waste Point/Creel Bay area. 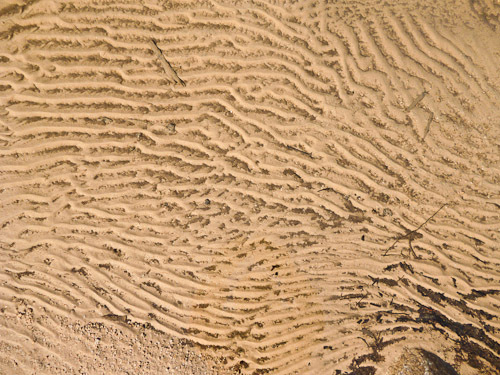 Some texture in the sand under the water. 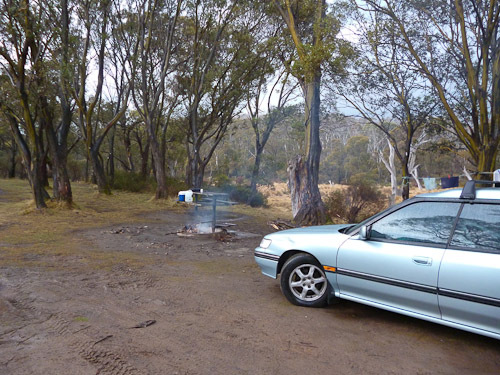 Camping out at Thredbo Diggings. This morning it started raining. 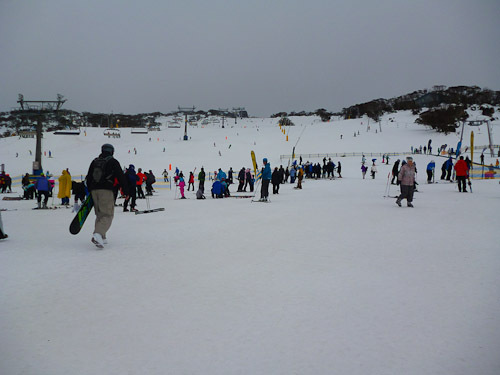 It is also raining up the mountain at Perisher Valley. They have been predicting rain for about three days and it finally arrived. Hopefully it turns to snow because this slush is not nice. 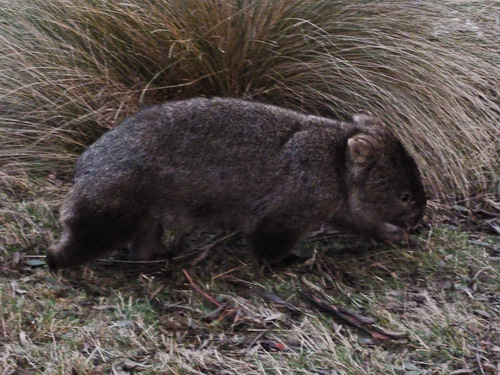 The other day we spotted a Wombat at the back of our camp. He just blundered along the edge of the clearing, heading up the hill. This is my camp at the Thredbo Diggings, a couple of kilometers from the bottom of the skitube. And this is the skitube station at Perisher.